Have you ever sat through a sermon you couldn’t follow? You know the kind I’m talking about? Where the pastor is making a lot of, possibly interesting, points and observations, but you’re exactly sure how they all fit together? Now, it may be the case that you simply have a poor attention span and the listening skills of a junior higher. OR, it may be that the sermon lacked what the quality of ‘unity’, of actually having a singular, cohesive point that the preacher was aiming to communicate. When it’s not there, it’s pretty hard to find. Read the text with an eye towards finding the main idea the writer is communicating in the text, or a sub-theme with enough exegetical support from the text to be the point of an entire message. Boil that down into a simple sentence. Sounds simple enough in theory, right? The problem is that many of us can’t really force ourselves to do that. If you’re fresh out of seminary, you’re too tempted to write out some complex thesis statement with 15 modifiers, sub-clauses, and so forth, because, hey, that’s what your profs liked in your exegesis class. This was one thing my old boss Jay always emphasized with me during my internship, because I tended to think in paragraphs, not pithy sentences. When the sinful nation of Israel went into exile, its messianic hope and vision were mistakenly and faithlessly diminished because pre-Ezran and pre-Nehemiac proofs of God’s sovereign plan, purpose, and intentions for his people were obscured in Babylonian circumstances of incarceration and oppression that would not be relieved until the Persian emancipation and further covenantal revelation in advancing redemptive history. God remains faithful to his people. Seeing it put that starkly, some pastors, especially the younger, bookish, ultra-academic ones, might chafe at this sort of abridgement. I know because part of me still does as well. That said, after 2 1/2 years of preaching to college students, I can attest that Chapell’s 3 a.m. test, while seeming a bit stringent, is probably a good rule of thumb. Realize, Chapell is not advocating for simplistic exposition of the text, or avoiding delving into historical complexities, or even using words like ‘messianic.’ The point is that having a clear, concise, thesis statement gives you a base upon which you can organize all of those complexities in a coherent framework for your people to follow. Whether you state it up front, or weave it subtly throughout, simply having it will focus your sermon construction and keep it from becoming a rambling mess that the Spirit has to work despite, not through. And that’s a good thing, right? Right. 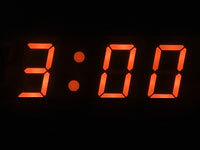 So, pastors, if you’re looking to preach in a fashion that your people actually understand the point you’re driving at, don’t forget the 3:00 a.m. test. I wholeheartedly agree with Chapel. Communicating one big theological idea is really good homiletic practice. In the mind of the hearer this Idea becomes the center of the sermon. It’s easy then deduct applications from this idea and illustrations to explicate it further. Not bombarding the audience with all the exegetical and theological minutiae in your arsenal is in my opinion actually the spiritual discipline of service and sign of humility. Love, love, LOVE Chapell’s lectures based on his book on Christ-centered preaching. Grown and shaped very much by that effort of his. Yeah, the 3:00 AM test is legit – no lie – and one that is often some of the hardest work of sermon prep. Saying a bunch of true stuff is actually not that hard – but saying one big idea from the text well in a coherent way is a big deal. Still learning this one and loving every minute of the struggle – God is good to use us weak vessels.